Explore the solar system with this unique puzzle while expanding your knowledge of planets and more. The pieces of this puzzle are actually shaped like the planets and other stellar bodies. 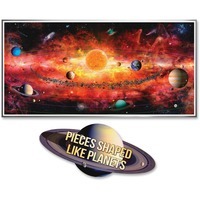 Instead of frustrating pieces that depict the vast blackness of outer space, this colorful puzzle includes a clue on every single piece as to its location whether it be background galaxies, quasars, satellites, nebulas, comets, colored planet orbits, space stations or the beautiful background glow of the Milky Way. For assistance, a larger poster of the completed image inside features outlines of all of the uniquely shaped pieces. On the back of the puzzle, a planetary guide tells you all about the sun, planets and other stellar bodies. The 500 piece puzzle is designed for children ages 8 and up.